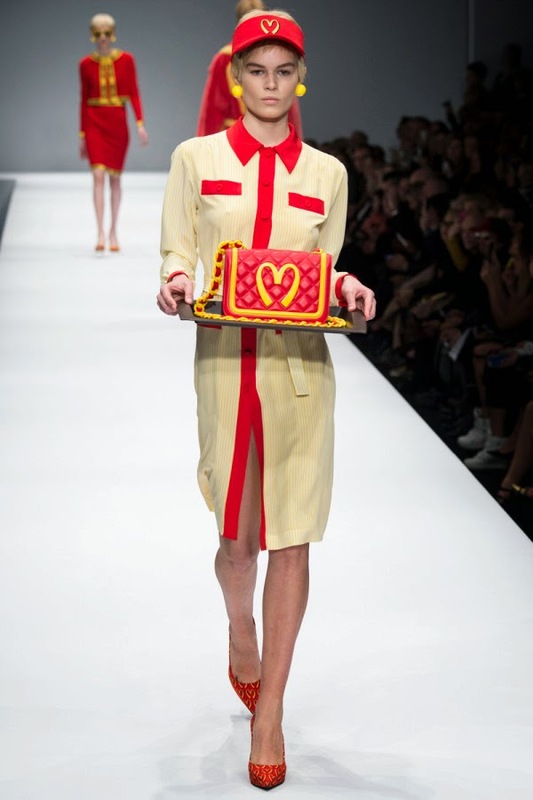 Drawing a comparison between fast food and fast fashion, Moschino's new creative director, Jeremy Scott, took inspiration from McDonald's for his debut runway collection during Milan Fashion Week. 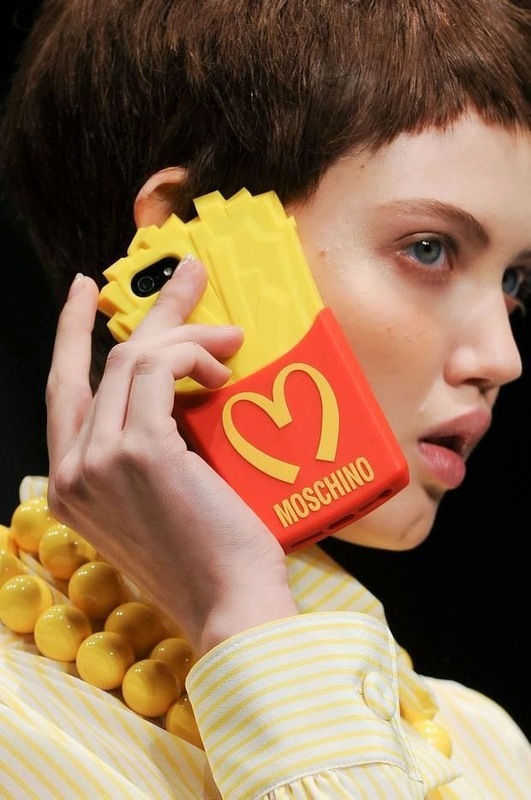 Collection payed homage to 90s American brand iconography: Cheetos, Hershey’s, Froot Loops, SpongeBob SquarePants, and McDonald’s - its trademark Golden Arches curved into a heart-shaped 'M for Moschino' motif - were all referenced. Scott is a savvy match for Moschino, a label known for its irony and irreverence. Moschino's red quilted leather bag - an ode to McDonald’s trademark Happy Meal Box, presented on a tray on the runway - has already sold out. Anna Dello Russo and Chiara Ferragni both were spotted carrying this bag during fashion week. Among the colourful line-up of pieces are a bright red quilted nappa bag, belt, sweatshirts, T-shirt, a woollen maxi sweater as well as a T-shirt declaring "I Do Speak Moschino" and a "French Fry Case" that looks as though it is in fact a takeaway portion of the fast food. Each piece is typically irreverent Jeremy Scott-style fun. The next day, a ten-piece capsule collection from the fall/winter 2014-15 fashion show, titled Fast Fashion - Next Day After The Runway, went on sale in Moschino boutiques and online.